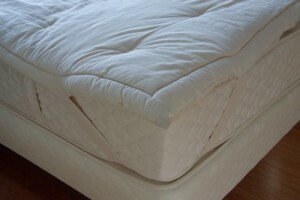 Mattress toppers are removable bedding that is placed over the mattress. They are typically purchased for additional comfort, especially if there are limitations to your regular mattress. For instance, a high-quality organic wool mattress topper may provide a softer surface if the mattress is too firm. It adds a luxurious feel of softness, while maintaining the support your body needs while asleep. An organic wool mattress topper may be just what you need for a more comfortable and healthy sleep. The material that goes into an organic wool mattress topper is considered perfect for all seasons. Wool is a natural fiber that comes from the coat of sheep. The Organic Trade Association states that wool can only be certified as organic if it is grown, harvested, and treated following federal standards. Some of the federal requirements for producing organic wool include letting the sheep graze freely to eat organic grass, and raising sheep without synthetic hormones, genetic engineering, and pesticides. Moreover, farmers must ensure healthy livestock. As long as an organic wool mattress topper is certified organic, you can be sure that it is free of harmful and toxic chemicals and that it is naturally fire retardant. One of the problems with conventional wool products is the fire-retardant treatment that they go through. Natural wool never goes through this process because it can naturally prevent fire from growing or spreading fast, in case the material catches fire. Harmful chemicals and fire retardants found in conventional mattress toppers may off-gas to be absorbed by your body, causing certain types of cancers and different health problems related to fertility and development among others. You will find an organic wool mattress comfortable regardless of the season because the material whisks away moisture when it is hot, and keeps your body warm when it is cold. Organic wool does not contain harmful pesticides because it naturally repels dust mites and bacteria. When harvesting, organic wool is never treated with bleach or washed with conventional soaps so it retains lanolin, which keeps dust mites away.